Learn to use options from veteran option trader Mark D Wolfinger, who spent more than 20 years as a market maker on the floor of the Chicago Board Options Exchange (CBOE). Learn why stock options, a versatile investment tool that has seen explosive growth over the past few years, should be used as part of your overall investment strategy. Whether you are new to options or already trade them, this book provides a thorough understanding of option pricing, strategies and the importance of risk management. Learn to adopt more advanced option strategies: iron condors and double diagonals; learn to protect your nest egg and, at the same time, earn healthy returns. Unlike many options guides, this book features step-by-step instructions on how to write covered calls, with extensive examples that outline the pros and cons of writing each call option. Wolfinger shows you how to analyze alternatives and explains why each may be appropriate for a particular investor with specific investment objectives. You will develop a basis for deciding what is suitable for you and your investment philosophy. A thorough understanding of option basics will help you move on to powerful strategies than may earn high returns with limited risk. Wolfinger's suggested strategies help ensure that your portfolio survives a market downturn. Stock options first traded on an exchange a mere 39 years ago. More than 4 billion options traded in 2011. Many people dabble in options without understanding how they work and how they can be used most effectively. 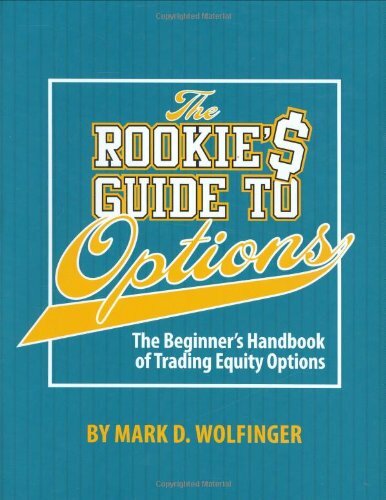 The Rookie s Guide to Options: The Beginner s Handbook of Trading Equity Options will give you the basic trading tools you need to start trading options profitably, as well as help you move on to more advanced strategies. You will be guided step-by-step as the author takes you through the decision-making process. Learn the language of options: puts, calls, strike prices, expiration dates, synthetic equivalents etc. This book, is aimed at the beginning to intermediate options trader. You have been using options for years, even if unaware. Ever bought car insurance? That's very similar to a put option. Ever use a rain check at a discount store or used a bus transfer? Those are call options. If you thought options were too complicated, Wolfinger gives a clear and detailed explanation that puts that myth to rest. You will see how to adopt basic options strategies, how to use them to earn profits and how to manage risk effectively. Learn how you can use options to: 1. Sell your stock above market value. 2. Turn a non-performing stock into a profitable investment. 3. Protect your holdings against a disastrous bear market and even profit in a bear market. 4. Create steady income. 5. Manage risk. 6. Earn profits more often than those who buy only stock. 7. Limit losses. 8. Own investments that earn a profit when the market moves higher or lower. The Rookiess Guide to Options shows you how to get the most out of these versatile tools. If you have any questions about this product by Brand: Options for Rookies Books, contact us by completing and submitting the form below. If you are looking for a specif part number, please include it with your message.